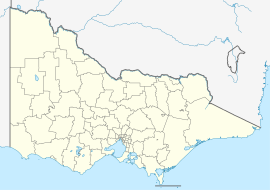 Wodonga /wəˈdɒŋɡə/ is a city on the Victorian side of the border with New South Wales, 300 kilometres (190 mi) north-east of Melbourne, Australia. It is located wholly within the boundaries of the City of Wodonga LGA. Its population is 39,351 as of the 2016 Census  and is separated from its twin city in New South Wales, Albury, by the Murray River. Together, the two cities form an urban area with an estimated population of 92,218. Founded as a customs post with its twin city Albury on the other side of the Murray River, the town grew subsequent to the opening of the first bridge across the Murray in 1860. Originally named Wodonga, its name was changed to Belvoir then later back to Wodonga. The Post Office opened 1 June 1856 although known as Belvoir until 26 July 1869. It had previously been regarded as the smaller, less prosperous cousin of the two. Whilst still somewhat smaller than Albury, economic growth in both areas has ameliorated such distinctions. Under the Köppen climate classification, Wodonga has a humid subtropical climate (Cfa). The city gets around 125.1 clear days annually. Wodonga is in the federal Division of Indi. The current representative for the Division of Indi is independent member Cathy McGowan. Wodonga is in the Victorian Electoral district of Benambra. Bill Tilley of the Liberal Party was elected member for the electoral district of Benambra in the 2006 Victorian State Election in November 2006. He was re-elected in the November 2010 Victorian State Election. Much of the arts and theatrical activity in the region is conducted in a cross-border fashion; for instance HotHouse Theatre is located almost equidistant from the Wodonga and Albury city centres. Wodonga is served by the Apex Club of Wodonga, the Wodonga Lions Club and two Rotary clubs – Belvoir Wodonga and Wodonga. Community Service is important to the Wodonga Community and activities such as the cities Australia Day Celebrations, Christmas Carols and the display of Santa's throughout the City over the festive season would not be possible without community service clubs. Recently Apexian Dean Freeman was awarded National Apexian of the Year for community service efforts throughout the area and overseas. Leonard Hubbard recorded the song Wodonga in 1924. There are three Australian rules football clubs in Wodonga, the Wodonga Football Club, the Wodonga Raiders Football Club and the Wodonga Saints Football Club. Wodonga and Wodonga Raiders compete in the Ovens & Murray Football League, while the Wodonga Saints compete in the Tallangatta & District Football League. There are many other sporting clubs in the region. Brisbane Lions dual-premiership player Daniel Bradshaw and celebrated St. Kilda forward Fraser Gehrig are originally from Wodonga. Wodonga is also home to a number of cricket clubs which compete in the Cricket Albury Wodonga (CAW) competition. These include the Belvoir Eagles, Wodonga Bulldogs and Wodonga Raiders. Wodonga has two Rugby League Clubs called the Wodonga Storm and Wodonga Wombats that play in the Murray Cup. Cyclists are catered for by the Albury Wodonga Cycling Club. The Albury Wodonga Cycling Club holds club races most weekends, is part of the Riverina Interclub and hosts the annual John Woodman Memorial Wagga to Albury Cycling Classic. Wodonga has a horse racing club, the Wodonga & District Turf Club, which schedules around seven race meetings a year including the Wodonga Cup meeting in November. Golfers play the course at SS&A Wodonga on Parkers Road. Australian Socceroos Archie Thompson and Joshua Kennedy played for soccer team Twin City Wanderers as children. Wodonga Diamonds Football Club and Wodonga Heart Football Club are two other soccer clubs based in Wodonga. All three clubs compete in the Albury Wodonga Football Association. In early 2014, a new club representing the region and playing its games in Wodonga was founded as Murray United F.C.. It will compete in the National Premier Leagues Victoria 1 from 2015. The World's Biggest Rolling Pin (listed in the Guinness Book of World Records) is located in Wodonga, atop "Henri's Bakery". Wodonga also has a radio controlled car site with both on road and off-road tracks on the Lincoln Causeway. Major secondary industries based in Wodonga include a logistics distributions hub (LOGIC), a large cattle market, a pet food factory (Mars Petcare), a can factory (Visy), a cardboard box factory (Visy Board), a hydraulic hose manufacturer (Parker Hannifin), an abattoir, a foundry (Bradken Limited), a polypropylene film manufacturer (Taghleef Industries(formerly Shorko) a concrete pipe & pole manufacturer (Rocla) and a transformer manufacturer (Wilson Transformers) as well as a variety of other smaller enterprises. It also serves as a central point for the delivery of government services to the surrounding region. It houses the Australian corporate headquarters for Mars Corp. Wodonga is the site of an Australian Army logistics base and a training centre for Army technical apprentices, the Army Logistic Training Centre, which is based at Latchford Barracks and Gaza Ridge Barracks. It is also the home of a campus of La Trobe University and Wodonga Institute of TAFE. A daily tabloid owned by Fairfax Media, the Border Mail, is printed in Wodonga. The Border Mail has offices in both Albury and Wodonga. Wodonga is part of the Albury-Wodonga/Murray/North-East Victoria television market and has access to all major TV networks. Channels available include Prime7 (part of the Seven Network), WIN Television (part of Network Ten), Southern Cross Nine (part of the Nine Network ), as well as the Australian Broadcasting Corporation (ABC) and the Special Broadcasting Service, more commonly known as SBS. Several of these networks also offer additional digital-only channels, including ABC2, ABC3, ABC News 24, SBS Two, 7Two, 7mate, One, Eleven, 9Gem and 9Go!. Two television news bulletins featuring local content are offered in Albury-Wodonga and the surrounding region. Prime7 broadcasts its bulletin live at 6.00pm from studios in Canberra. WIN Television's bulletin is produced in Ballarat but features Albury-Wodonga region based content, and airs on delay at 6.30pm. Southern Cross Ten also provides short local news updates which are produced in Shepparton, Victoria, however these do not feature significant local content from the Albury-Wodonga region. There are three commercial radio stations broadcasting into Wodonga that are based over the border in Albury, namely 1494 2AY, Triple M The Border 105.7, and Hit104.9. Notably, Hit FM south eastern network is programmed out of the Albury/Wodonga Hub, going to centres around New South Wales, Victoria, Tasmania and into South Australia. Broadcast out of the same building is Triple M The Border, which is also networked to local stations around New South Wales, Victoria, Tasmania and South Australia. Albury/Wodonga is one radio market, thus advertisements are directed to both sides of the border. The Albury/Wodonga market underwent significant change in 2005 when Macquarie Southern Cross Media bought 105.7 The River from RG Capital Radio Network, and 2AY and Star FM from the DMG Radio Australia. Due to cross-media ownership laws preventing the ownership of more than two stations in one market, Macquarie was required to sell one of these stations and in September 2005 sold 2AY to the Ace Radio network. 2AY takes its night time programming from 3AW Melbourne. Commercial radio stations from Wangaratta (3NE, Edge FM) and Shepparton (3SR, Star FM) can also be received in some parts of Wodonga. The ABC produces breakfast and morning radio programs through its local radio network, from the studios of ABC Goulburn Murray located in Wodonga on 106.5FM. The rest of their content is delivered from Melbourne. The ABC also deliver ABC Radio National, ABC Classic FM, and Triple J on 103.3 FM. There is also a community radio station known as 2REM 107.3 FM. The Albury-Wodonga Community Radio station plays a large amount of speciality programs including those for the retiree, ethnic and aboriginal communities throughout the day and a range of musical styles including underground and independent artists from 8:00pm onwards. In addition, the area is serviced by a Radio for the Print Handicapped station, 2APH, on 101.7 FM. Wodonga TAFE runs its own broadcasting training station, 87.8 Wodonga TAFE Radio. Other stations include the Albury-Wodonga Christian Broadcasters' 100.7 The Light, and the dance formatted narrowcaster RawFM on 87.6 FM. Wodonga railway station lies on the Melbourne–Albury and Melbourne–Sydney lines. The Sydney to Melbourne railway line, which ran through the centre of Wodonga has been relocated to the north of the town. A new railway station was also recently constructed. The new line was officially opened in late 2010, for which the town held a celebratory day for the last commercial passenger train to pass through the town centre. Wodonga is on the junction of the Hume Highway (the main route from Melbourne to Sydney) and the Murray Valley Highway (which follows the southern bank of the Murray River). Local public transport is provided by Dysons (which took over Mylon Motorways) who run buses on a number of routes both within Wodonga and to Albury. Bus services are generally quite infrequent and public transport use in Wodonga is very low. There are also long-distance bus services to the capitals. There is a comprehensive network of bicycle paths in Wodonga, including one across the Lincoln Causeway to Albury. Albury Airport, which provides scheduled commuter flights to Melbourne and Sydney, is a short drive from Wodonga. From 2006, the three government high schools have merged to form a senior college for Years 10, 11 and 12, known as Wodonga Senior Secondary College, and a school for Years 7, 8 and 9, known as Wodonga Middle Years College, on two campuses; Felltimber and Huon Campus. The former 3 public high schools in Wodonga were Wodonga High School, Mitchell Secondary College and Wodonga West Secondary College. Wodonga High School celebrated its 50th birthday in 2005. Private schools in Wodonga include: Catholic College Wodonga, Trinity Anglican College, Victory Lutheran College, Mount Carmel Christian School, St Augustines Primary School, St Monicas Primary School and St Francis of Assisi Primary School (formerly Frayne College). Higher education is served by the Wodonga Institute of TAFE and La Trobe University. The regional Wodonga campus of La Trobe University was established in 1991 and provides courses in education, health sciences, biology, and business. Wodonga is also home to the Flying Fruit Fly Circus School, the educational arm of The Flying Fruit Fly Circus, that provides educational services with an emphasis on the performing arts and contemporary circus training. In 2003 a devastating fire destroyed the school's facilities at, then Wodonga High School, and the school relocated to Wodonga West Secondary College (now Wodonga Middle Years College Felltimber Campus). ^ "3218.0 – Regional Population Growth, Australia, 2016-17: Population Estimates by Significant Urban Area, 2007 to 2017". Australian Bureau of Statistics. Australian Bureau of Statistics. 24 April 2018. Retrieved 12 October 2018. Estimated resident population, 30 June 2017. ^ Premier Postal History. "Post Office List". Retrieved 11 April 2008. ^ "Climate statistics for". Bureau of Meteorology. Retrieved 1 June 2016. ^ "HotHouse Theatre". www.hothousetheatre.com.au. Retrieved 22 June 2008. ^ National Film and Sound Archive: Does your town have its own song? ^ Albury Wodonga Cycling Club. "Albury Wodonga Cycling Club". Retrieved 11 February 2013. ^ Country Racing Victoria. "Wodonga & District Turf Club". Archived from the original on 7 January 2009. Retrieved 7 May 2009. ^ The SS&A Club. "SS&A Wodonga". Retrieved 13 November 2009. ^ "UNITED FRONT: Border launches Premier League club". www.bordermail.com.au. Retrieved 5 November 2014. ^ "Biggest Rolling Pin – Wodonga, Victoria". Archived from the original on 17 October 2007. Retrieved 7 October 2007. ^ "Welcome to Albury Wodonga" (PDF). Defence Community Organisation (Australian Government). 2011. Retrieved 10 September 2013. ^ "The Light". Retrieved 8 January 2014. ^ "North East Rail Upgrade – Project overview". Department of Transport. www.transport.vic.gov.au. Retrieved 22 June 2008. ^ "Mylon Motorways – Temporary Timetable List". www.buslines.com.au. Retrieved 22 June 2008. ^ "WODONGA SENIOR SCHOOLS SET TO IMPROVE". Media Release: MINISTER FOR EDUCATION. www.dpc.vic.gov.au. 3 October 2005. Retrieved 22 June 2008. ^ "Flying Fruit Fly Circus's school destroyed". The Age. www.theage.com.au. 3 February 2003. Retrieved 22 June 2008. ^ "FRUIT FLIES TO FLOCK AT WODONGA WEST". Media Release: MINISTER FOR EDUCATION. www.dpc.vic.gov.au. 28 April 2004. Retrieved 22 June 2008.